Washington Capitals: Did Tom Wilson's Fight Help or Hurt? In the first period of Game 7 of the Eastern Conference Final between the Washington Capitals and the Tampa Bay Lightning, during a post-whistle scrum as Washington led 1-0, Lightning defenseman Braydon Coburn ripped the jersey off of Capitals center Evgeny Kuznetsov and threw it on the ice. Capitals forward Tom Wilson, no stranger to confrontation, took exception. The referee held back an enraged Wilson as he attempted to charge after Coburn and punish him for the insult. The two players received matching roughing minors, but the drama did not end there. Immediately after the two were released from the penalty box, they threw off their gloves and fought. Wilson got the best of Coburn in the scrap, and the Capitals went on to win the game 4-0. A playoff fight is rare, a Game 7 fight even rarer. In fact, the incident was the first fight in the first period of a Game 7 since the 1990 Norris Division Final. Given the rarity of the matter, the magnitude of the game in which it occurred, and the ongoing debate on the role of fighting in hockey, the narrative surrounding the fight has been unsurprisingly mixed. Some believe the fight was a rallying point for the Capitals and helped spur the team to its first Eastern Conference title since 1998. Others believe Wilson’s decision to fight was a shortsighted, emotionally fueled outburst that put his team at a tactical disadvantage. Here are the main arguments for and against Wilson’s decision to drop the mitts. In an on-ice interview after the game, NBC’s Pierre McGuire asked Wilson about the fight. Wilson’s immediate response was noting that Coburn threw Kuznetsov’s sweater down on the ice. Hockey players can be extremely protective of the symbols that represent their teams. Much like stepping on the locker room logo, disrespecting a team’s sweater is often considered a capital offense. Wilson chose to make Coburn answer for the perceived disrespect the way many hockey players before him have issued their grievances: by dropping the gloves and fighting the offender. While this is a very arbitrary and symbolic justification for the fight, a defender of fighting in hockey would argue that Wilson’s defense of the Capitals’ name galvanized the team, thus impacting its on-ice performance. There’s little doubt that sacrifice was a key theme in the Capitals’ Game 7 victory. From Devante Smith-Pelly blocking a shot with his neck to Brooks Orpik returning to the game in the third period to help defend the Capitals’ 3-0 lead after Cedric Paquette of the Lightning laid a suspect hit on him in the second frame, Capitals players were putting everything on the line to secure the win. It’s possible that Wilson standing up to defend his team provided some tangible inspiration for the rest of the Capitals to do the same. 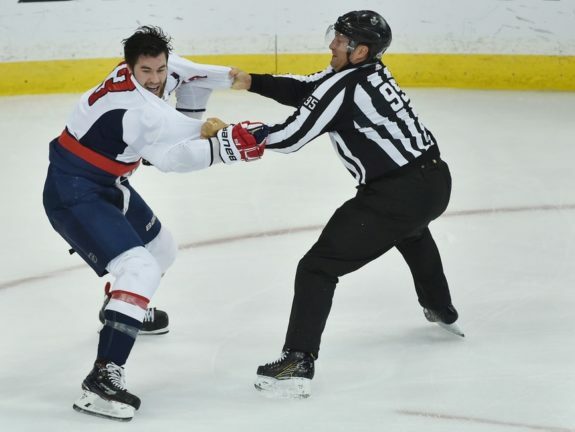 Additionally, the fight may have helped ‘set the tone’ for the Capitals’ physical style of play, a major reason for the team’s success late in the series. The fight certainly had a few concrete, negative implications. First, and most obviously, it halted an offensive opportunity for the Capitals. Washington’s third line had generated a fair amount zone time as Wilson and Coburn served their initial minors, but the fight forced the referees to blow the play dead before any Capital could get a clean shot on Tampa Bay goaltender Andrei Vasilevskiy. Moreover, the matching five-minute fighting majors Coburn and Wilson received for the fight was an uneven trade-off for the Capitals. 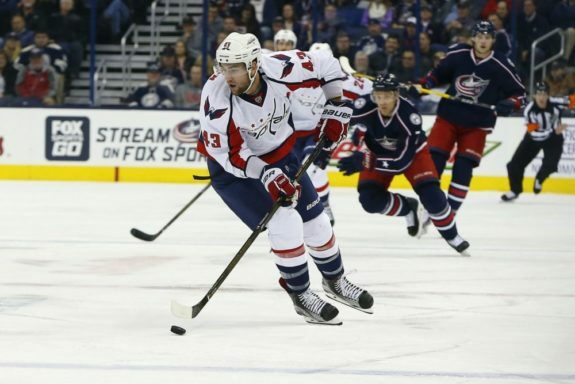 Wilson is a key aspect of the Capitals’ top line that features Wilson, Kuznetsov, and Alex Ovechkin. Coburn, on the other hand, is a third-pairing defenseman. While Wilson served the major, Devante Smith-Pelly took his place on the top line. The Kuznetsov, Ovechkin, Smith-Pelly trio failed to produce any legitimate chances. All else equal, an ineffective top line hurts a team far more than briefly missing a depth defenseman. Clearly, the Capitals found success after the fight occurred, extending the lead from one to four by the end of the night. However, there is an issue of correlation and causation. After all, the Capitals’ style of play did not noticeably change following the fight. 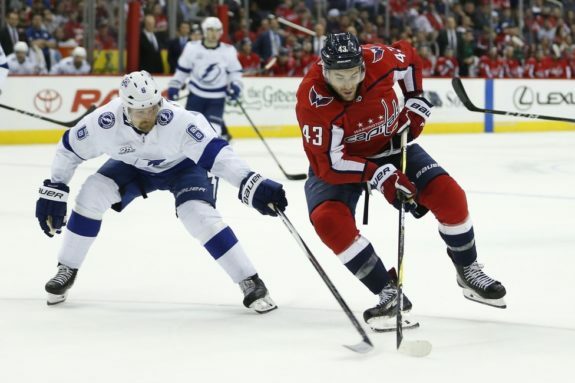 Many pivotal events altered the course of the game, such as Lighting forward Yanni Gourde whiffing on an open net as the puck sat just inches from the goal line, Capitals goaltender Braden Holtby stopping Alex Killorn of the Lightning on a breakaway, and Capitals’ forward Andre Burakovsky’s two second period goals. It is difficult to say whether Wilson’s fight had a greater impact than any of these events that had a real, calculable effect on the final score. Most likely, personal opinions on Wilson’s fight depend on personal opinions on hockey fights in general. A believer in ‘the code‘ will cite the final score and argue that the motivation the fight gave the team for the duration of the game offset any short-term match up issues it created. A person more questioning of fighting’s place in hockey will argue that at this stage of the playoffs, teams do not need additional motivation. The Capitals’ were already fully bought in, so the fight only caused problems without affecting the way the team played.